Your kids can join Gryffindor House for Halloween with a Kids' Harry Potter Gryffindor Robe Deluxe Costume. This kids' Halloween costume consists of a lightweight robe with a hood. The robe is decorated with the Gryffindor coat of arms. Your kids can join Gryffindor House for Halloween with a Kids' Harry Potter Gryffindor Robe Deluxe Costume. This kids' Halloween costume consists of a lightweight robe with a hood. The robe is decorated with the Gryffindor coat of arms. This kids' costume looks just like the Gryffindor robes in the Harry Potter films. Just add a white shirt, tie and black shoes to complete this easy Halloween costume. 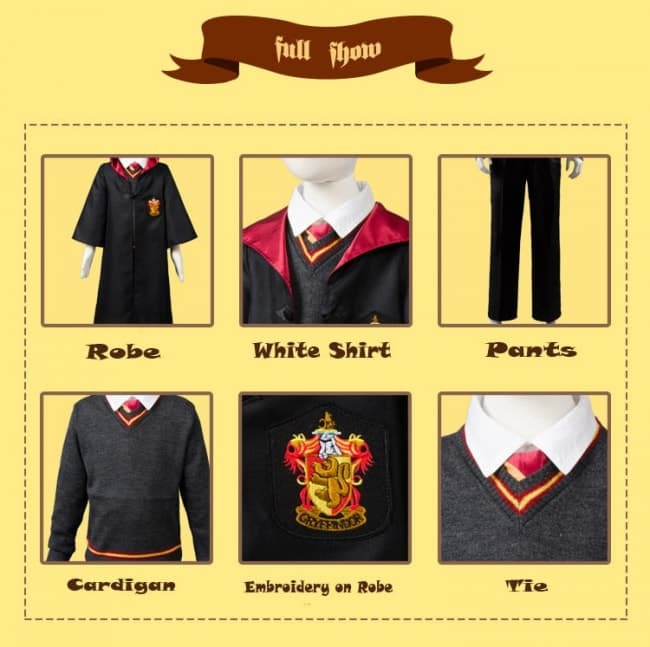 Harry Potter Complete Cosplay Costume for Kids.